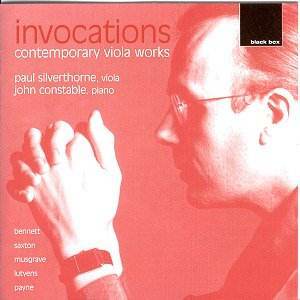 With this disc Paul Silverthorne triumphantly reinforces his position as commissioner and executant of contemporary viola music. With the exception of Lutyens all the composers here are still vigorously active - and Lutyens' influence is reflected in two of her pupils, Saxton and Hawkins; most of the composers are British. The longest piece is the first, Richard Rodney Bennett's After Ariadne. It demonstrates many of the qualities both Silverthorne and the viola encourage - allusion, reflection, and things veiled, hidden and emergent. Though not obviously in variation form Bennett unfolds his source - Monteverdi's madrigal Lasciate mi morire - only at the end of his lament. Clearly a model here must be Britten's Lachrymae. Both pieces share a sense of revelation and unfolding, a final simplicity of utterance reached through struggle - and if Bennett is not Britten's equal then at least his vision shares something of the older composer's transcendence. Saxton's piece shares qualities of depth of tone, a certain keening - in his case specifically Jewish - and its fulfilment in a Rabbinic prayer, alluded to earlier but emerging at the close as a kind of benediction. The viola is well suited - tonally and expressively - to this kind of confidentiality of utterance; throughout the disc composers respond to darker tone colours and an element of fragility to produce works of searching depth. Thea Musgrave, for example, speaks of her little piece's "peaceful contemplation" but this belies its amplitude of expression, with a remarkable concentration of feeling and thought in its four minutes. Anthony Payne's Amid the Winds of Evening encompasses varying tempo and rhythmic features and shares with other pieces on this disc the great gift of saying much in a short span of time. John Woolrich, like Saxton and Bennett, turns to source material and like Bennett he has turned to Monteverdi. O sia tranquillo is especially hypnotic in its beauty. Colin Matthews' Oscuro is veiled, rocking, fractious and lyrical and impresses with its compelling aloofness. But all the works impress; from Lutyens' own piece, the most fearsomely difficult with its agonizing quadrupal stopping, through Hawkins' dark explorations of colour and feeling, MacRae's fascinating sonorities and finally Kampela and Tienssu; the former aggressive and the latter exploring the journey from taut rhythmic attack to benevolent silence. From extreme technical demands to lyric simplicity, from tonal amplitude to wisps of sound, Silverthorne and John Constable, the most responsive pianist, emerge as worthy ambassadors of the contemporary literature in a disc of which Black Box should take great pride.